Produced by Fabrik Entertainment, a Red Arrow Entertainment Group company and based on Michael Connelly’s best-selling novels, the Emmy-nominated hour-long series Bosch stars Titus Welliver (Lost) as Detective Harry Bosch, Jamie Hector (The Wire) as Jerry Edgar, Amy Aquino (Being Human) as Lt. Grace Billets, Madison Lintz (The Walking Dead) as Maddie Bosch and Lance Reddick (The Wire) as Deputy Chief Irvin Irving. In season three, based on Connelly’s best-selling novels The Black Echo and A Darkness More than Night, Bosch’s teenage daughter, Maddie, has come to live with him and ushered into his personal life the everyday responsibilities of being a single father. 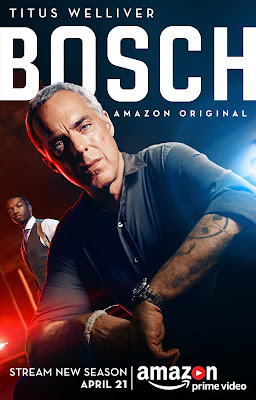 Bosch remains a tenacious cop who struggles to attain justice in an imperfect system; a system in which the guilty sometimes go free, and marginalized and forgotten victims become anonymous statistics. Now, between the murder of a homeless veteran, the slaying of another man tied to several unsolved homicides, and a high-profile murder trial involving a Hollywood director, Bosch has taken on his most formidable cases to date.